If you see the food blogs nowadays, it is overblown by different kinds of festivals dishes just like our Television, wherein there is a program for every festival. 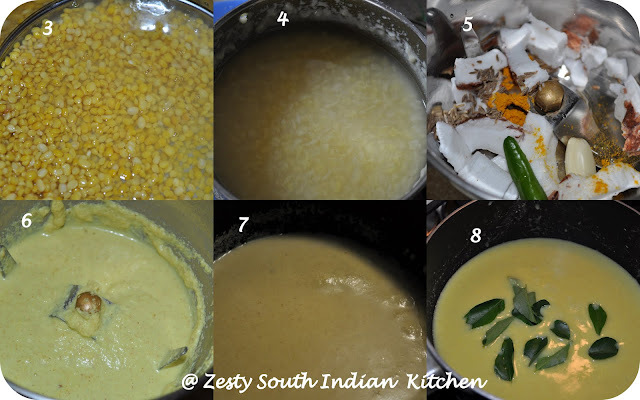 Some of the blogs takes a popular dish and to compare with other dishes in other parts of India. I believe that Kerala cuisine is unique just like any other cuisine; even if you take any particular dish, the differences arise depending upon the region of Kerala. Now some of the dishes might have some likeliness to dishes from other parts of India, but no straight forward comparison. Onam is the most famous festival from my home state Kerala, which is celebrated with lots of fun and enthusiasm. It also comprises a feast which includes wide varieties of vegetable entities with its unique flavor and taste. For the onam feast, rice and parippu curry is important for the people from southern part of Kerala. Other part of Kerala has rice but parippu curry is not important. 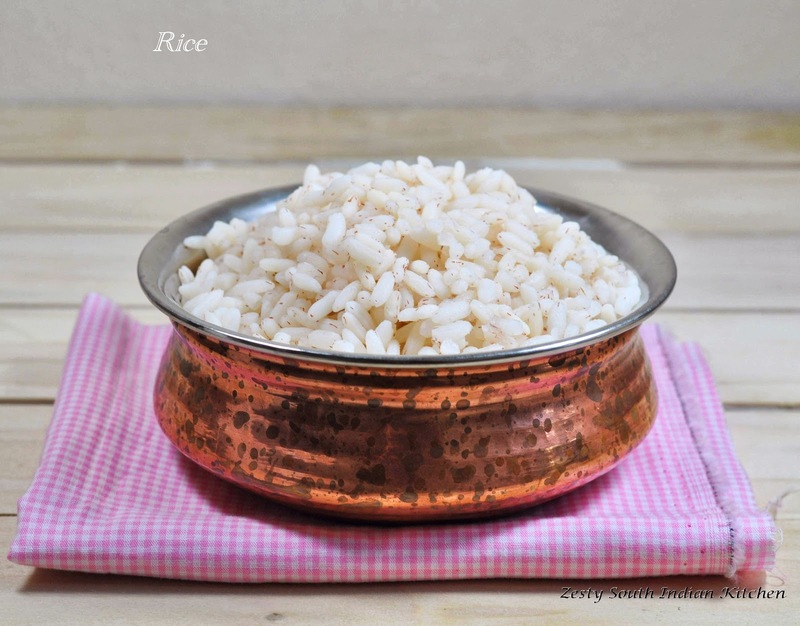 If you look for the variety of rice, you will be amazed to see that basmati rice is not that common in Kerala cuisine, it is only used for making biriyani, especially in the northern part of Kerala, if they have kaima rice they prefer it. We usually like to eat Rose matta rice (kuthari/ chemba ari), for making Payasam or sweet pudding we use raw matta rice ( Unakkalari). 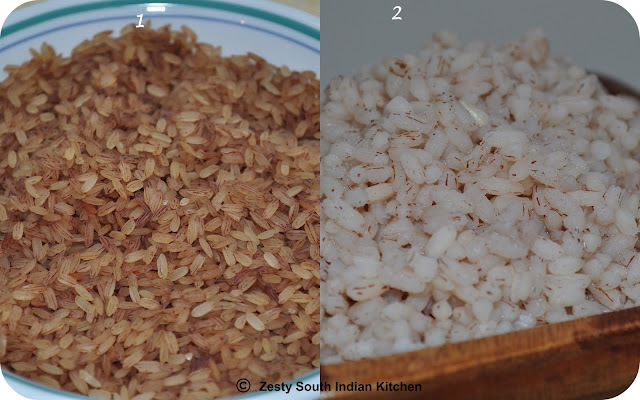 Rose matta rice or Red parboiled rice is commonly used in Kerala and Sri Lanka. It has a nutty taste, and is rich in fiber and is even good for diabetics (this I say from our experience as my hubby is diabetic. If he eats this rice in the night, his fasting sugar is much less than what it would have been if he had long grain rice). One disadvantage of this rice is that cooking time is more than the basmati rice or any other polished rice. So I discovered an easy method of pressure cooking the rice for 7 whistles or about 30 minutes and then letting the pressure cool down for 15 min. This method gives perfectly cooked rice. One more advantage of using this rice there will be no over cooking of the rice. It won’t easily become mushy like other counterparts. For parippu curry / lentil curry we usually use green moong dal/green gram. You can use both skinned as well as whole ones. I prefer to use skinned. To make curry, first fry the green gram for 2-3 minutes, then cook it well and is later incorporated with ground paste of coconut, cumin seeds, green chilies turmeric and garlic. Add salt and bring to simmer while not allowing boiling. Garnish with little bit coconut oil and curry leaves. No other seasoning is used. Here goes the recipe for both. In a pressure cooker wash and add rice along with 10 cup of water, it is better use to pan inside the pressure cooker and cook for about for 7 whistles or about 30 minutes and then letting the pressure cool down for 15. Once the pressure is released remove the cover and drain all the content into colander and drain the excess water. If you wish you can add some cold water into colander to prevent further cooking. Enjoy as much you wish. In a small skillet fry the split green gram for 2-3 minutes or until they change color. Wash and cook in pressure cooker for 2 whistles it takes about 15 minutes and set aside. In the food processor or grinder grind fresh coconut, green chilies, cumin seeds , turmeric and garlic clove with ¼ cup water into fine a paste and set aside. In the medium sauce pan add cooked mashed spilt green gram /parippu and ground coconut spice paste and salt, bring to simmer not let it boil. Finally garnish with curry leaves and coconut oil. Enjoy with rice and ghee. A heart-filling post Swathi.Very nostalgic and drooling over one ! Thank you. New one .. looks yummy. This looks wonderful! I love the term “cook for 7 whistles”. I am a huge fan of the pressure cooker and enjoy discovering new recipes that I can make quickly in it. Thank you for sharing your delicious recipes and hosting the Hearth and Soul Hop. Dal-chawal, thats kinda comfort meal for all of us. That red lentil curry looks super creamy delicious! 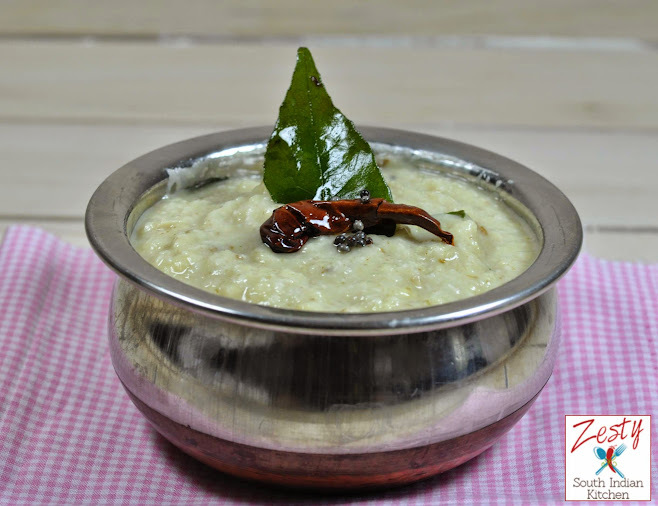 We have parippu in South Malabar but a simple, small spoonful unlike the South Kerala dishes. It is served, cooked with just salt and turmeric. Loved the simple parippu curry! Nice combo!! Curry looks creamy & delish. yum combo & loved reading the post ! I’m also introduced to parboiled rice quite recently by my Indian friend. Where did you get the Red parboiled rice? Very delicious and healthy looking rice and lentils curry. Woww fabulous and authentic rice and paruppu curry,sooo inviting.. Filling and delicious one, authentic presentation. You have put me in the mood for lentil curry. Actually, I’d like to go away to an Indian cooking school for a year or two. Eat and cook nothing but. Easy to prepare but delicious and healthy! This is perfect, Swathi! Plato muy delicioso ,luce cremoso y muy tentador,abrazos. Looks wonderful Swathi! 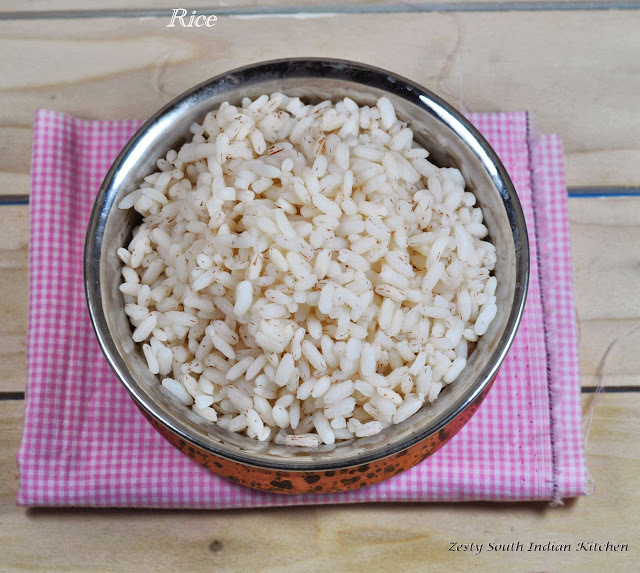 Thanks for sharing your method for making perfect rice! This sounds so good, Swathi! I can just smell all those gorgeous spices! What a perfect dish for autumn, and that rice looks so fluffy! Thank you for sharing your Rice and Lentil Curry with the Hearth and Soul hop. Thank you so much for teaching me to cook this type of rice.I was a bit alarmed at the ratio of 2:10 cups water.No wonder it took me hours to see the rice cooked.MANY THANKS. Thanks For The Help in cooking this red rice.i was wrong in the ratio of water…..took a long time to cook.will try this method.Thank!